In 2018, we already have plans to see multiple states. Here are our plans so far, which could very easily change as the year goes on. In the winter we would like to go to Wisconsin Dells. Apparently it's a big deal, but I've never been. We are toying with the idea of going sometime around the boys' birthday in January. There are a ton of waterparks there, and my understanding is that they are very family friendly (I don't like waterparks in general), so even the toddlers should be able to enjoy it and be safe. In early Spring, we are talking about possibly doing the Omaha Zoo and other activities in Lincoln and Omaha, Nebraska. This one is definitely not set in stone yet, but we've been talking about it and would love to make it happen, if possible! This would probably just be a weekend trip. We did this once before when my oldest was a year and a half and my other daughter was just a few months old. In late Spring, we have plans to go to Hilton Head, South Carolina! This is going to be our big vacation for the year. We have been wanting to do a beach vacation where we just don't have many plans and the kids can just dig in the sand and we can come and go at our leisure. So we're hoping for good weather the week we go! The kids are all obsessed with the beach and ocean, so it should be a lot of fun. We are planning to drive the first day to Atlanta and spend the following day at the Georgia Aquarium. We are doing a big ocean unit this year in our homeschool, so I think it would be a really cool way to finish up the unit! I would also really like to go to Charleston, if we have time when we're in Hilton Head, since it's only about a 2 hour drive and I have heard such wonderful things about it! We will probably at least stop in Savannah, GA on the way through, also. We are planning to rent a house for about a week, that way we can come and go as we please, cook our own meals, have laundry available, etc. Hopefully it will be within walking distance to the beach in HHI! On the way back home, we are thinking of stopping in Nashville, TN for a night or two to explore the sights around there and check Tennessee off of our list! 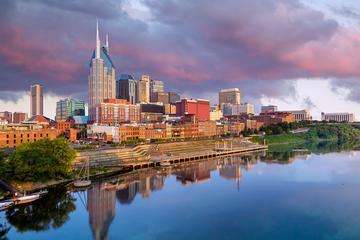 If you know of any good family friendly things to do in Nashville, send them my way! We will most likely be in either Texas or Colorado at least once next year, as well, visiting family. If all goes according to plan, we should be able to cross Wisconsin, Nebraska, Georgia, South Carolina and Tennessee off of our list by the end of 2018, leaving us with 39 states to go!